Thought about popping in to see CC when I saw the sign for Oxford on the way down, but figured she'd be out beginning the birthday celebrations! Looks lovely, Kate - no wonder you were pleased! No, I wasn't in - I was in Brighton buying my new guitar... Glad Pete enjoyed his flight though. Poor Red...glad you're feeling better today. A new guitar CC - do they wear out?! ;) Hope you had a nice day and got to visit the beach too! Glad you're feeling better Red - it's amazing how being ill can make you appreciate being well. I spent so long feeling just generally unwell that I now have a little "woo hoo" inside my head when I wake up feeling fine! Red, I'm sorry to hear you haven't been feeling well, glad you're better today. I hope you had a nice time with your Mom and Dad. Posted By: Kateb A new guitar CC - do they wear out?! Not as such, but imagine having driven a Trabant all your life then being given a Rolls Royce...! Very nice CC! Are you playing it lots or are you still just staring at it adoringly?! LOL!! These shops will sell all sorts of faulty stuff if they can get away with it! I love your Easter Egg, Red..looks yummy. CC, I'd take that new guitar back if I were you..it must be completely faulty. Haha finished the easter egg in about 2 days...Lyle was worse though, they got him a 1kg egg (bigger than his head!!) and he finished that in a few days too! Worth being poor if it's exactly the right thing. As long as you and the beasties don't starve! This village is amazing! You leave our house, walk up the street and turn left, and within a minute you can see the stars so clearly when there aren't any clouds. It's breath taking, I love stars. I could sit and stare at them for hours. Went for a late night walk with our friend last night, saw 10 shooting stars between us!! Tabby didn't come home last night - she was chased by next door's german shepherd at about 6pm and we didn't see her again all evening despite calling her. Thankfully I was on leave today, and I woke up at 6.30am but she still wasn't home. I got up and got ready, then went out round the streets calling her. I got home at 9am and bumped into a neighbour so asked if she'd seen her. While we were talking I heard a noise, then my neighbour heard it, so I called ... and she answered. I kept calling and narrowed it down to ... next door's garage. (An hour, a whole HOUR, trapsing round the streets and she was next door!) Thankfully they were in and able to open it. So relieved to have her home - good job she's got a big mouth with a loud meow! Wait...she was trapped in their garage?! Wow, lucky she was found nice and swiftly! I had a stray cat locked in my garage for three days. Then I couldn't get him to the door, he just squeezed into every little hidey there was. Tempted him out with a plate of meat and some water just outside the door and I went back indoors. That worked after a while. They use it for storage, and as they're renting and haven't been there long there wasn't too much stuff in there. They have a fridge (or upright deep freeze) in there so are in and out quite regularly. If it'd been one of the other cats I wouldn't have known they were there, but because she's verbal and very loud she shouted for help!!! We were both howling afterwards, couldn't move for laughing! Get a lot of amoebic dysentery up your way then, do you? Wasn't sure where to post this, but it has a happy ending! Got in the car to take Caitlyn ice skating yesterday morning, and as I was about to start the car I realised there was a rabbit (yes, a cute bunny!) sat between the 2 cars opposite (which are in front of their respective garages and remember, I live in a cul-de-sac). It was so pretty - blue and cream brindle. I couldn't just leave it, so tried to catch it with no luck. A taxi pulled up and the family that live 3 doors down got out. They said they thought their neighbours (4 doors down from me) might have one, so I rang the bell. The man came to the door and his first words were "is it the rabbit". (I couldn't decide if he'd been watching me and didn't care about it, or if it's not the first time!) I helped him to corral it back to his gate and into his garden, then headed back to the car and the rink. A strange Sunday morning that was!!! Wow, rabbit wrangling...expect a telephone call when mine refuse to go to bed! best: went to see Basshunter last night; it was awesome! Had a really good time...my right ear is 'ringing' still though from loud music, bleh! Basshunter?? Is it a movie or a music group? best: I emailed a company that makes *awesome* kibble, saying I thought their company was really good, I'm saving up to buy some of their grain free kibble (it's dead expensive) and was gonna buy Kasper some of their treats for his birthday. They emailed back saying thank you and that they will send me some free samples!! How nice is that? I was really surprised! We bought a few packs of treats from their website for Kasper's birthday, too, which I'm sure the pups will love...sheesh, Kasper is getting SO spoiled this birthday...then again he is turning 5, kinda a big deal! Wonder if it'd work for me if I emailed Audi and told them I think their cars are gorgeous!!!!! I don't think it would work quite as well with Audi, Kate..
Oh well, maybe I should start with a skoda and work up! My best of the day = I have found a gardener that isn't bothered that my garden is not "lawns and borders" style. In fact he's more of a handy man, which suits me as I can just point and he is my hands. Excellent, Ollie - we found one like that who is a labourer, not a gardener, and likes animals so has left a scratchy area for the chickens! PS My best - went out for birthday Afternoon Tea (posh sarnies -no crusts! - scones, cakes and gallons of tea) for the final phase of Birthday 2015! I'm beginning to like the "Longer Birthdays" trend. Should I start now, for December? Absolutely. Better start training your sherrylifting arm now! Oh CC that sounds good (minus the tea), I am sooooo hungry!! It's nice when the kids do something special for your birthday!! Well, they have been know to buy things for Lyle on father's day...never got me anything for mother's day of course, little stinkers! Ha ha!! That's kids for you! LYLE'S MAIN PRESENT ARRIVED!!! With three days to spare haha We had to go pick it up from the parcel office (didn't have to wait 24 hours though) and the customs charge was £22.29...holy moley! As if it didn't cost enough - the post office guy couldn't believe how much we had to pay and double checked, bless him! Does he know what it is yet or have you managed to still keep it a secret? What ever it is, take pictures so we can see too. He's not got it yet, but the thing the dogs helped me with is ready - I'll post it in Lyle's birthday thread! Wonderful - I hope you're feeling rested. Can they not give you some sleeping pills for those times, or do they clash with the other bits you're on? No, you aren't bothering the GP, you're just asking them to do their job! best: trimmed the hair on and under all Kasper's paws today, and between his toes. Snipped a dreadlock from his ear, AND trimmed the fur at the base of his tail! Then he got a thorough brushing. Kasper hates having his fur cut, it used to make him incredibly nervy and was always a two person job. I'd trim and Lyle would constantly feed him kibble. Today I did it all myself, he was marvelous and his feet look great! Hoping to give him an all-round trim before the weather really hots up. He looks a right state when I do it, but it soon grows in and he certainly prefers it to going to the groomers! I was watching Cesar Milan with a v. nervous dog at the groomers - he took aaaages because he said you have to go at the dog's speed and wait until they're comfortable before you proceed. Amazing difference in the dog's attitude. Wow, I am surprised to hear of Cesar Millan doing anything good with a dog. I guess very rarely he's bound to come up with a few good ideas, like how he's very pro-exercise for a dog. best: I ordered a pet portrait from someone I know through my blog. I sent them photos of the dogs so they could get a 'feel' for them, and today the artist sent me a photo of the completed canvas...it's amazing!! It's being shipped from America, so it won't be here for a while, but I'll post photos as soon as it arrives. It's sooo good! I'll share her etsy shop too, as far as I know she will do cat portraits! My granny, in her later years, would paint pet portraits in oils and one or two children too. She won some competitions with these but I don't have any details as she moved down South to be near her son. Went to Cosford Air Show today with hubby. Wasn't looking forward to it but it was great! (Apart from the ridiculous traffic queue to get in - joined it on the hard shoulder of the M54 and took another hour after that to get in, then massive queues on the M6 coming home ) The show itself was amazing. The Vulcan and the Typhoon were my favourites, but they were all fantastic. The Vulcan is coming to the end of it's flying days and is being grounded. I used to love air shows and we would go to several each year. The best ones are really the tiny airfields run by flying enthusiasts. Though Duxford takes some beating. My best experience was being taken in a helicopter from Yorkshire to the Farnborough show. Hubby wants to go to Duxford. I enjoyed the show, but not the journey there and back. Any tips? Are you better to go really early? Or is there no way to avoid the traffic and just to put up with it? Best thing yesterday was reserving 2 cats with a combined age of 36+ years! The lady had just lost her 2 young cats - they'd both been run over on the road within days of each other and she was heartbroken. She said she doesn't want to go through that again and it wasn't fair on the cats, so wanted an indoor cat, therefore it had to be old, deaf, or FIV, but the FIVs are quite young and would probably want an enclosed garden. She is happy that she might only have them for a couple of years but can give them a good life and have chance to say goodbye to them when the time comes. I've seen a few people turn balconies and conservatories into 'kennels' / play rooms for their cats (they had a specific name, but I don't remember it), along with others who have a totally secure run in the garden they can explore. They fill them with shelves, the cat trees and things to climb, and the cats seem to really enjoy it. I don't know how I feel about indoor / outdoor cats, they both have such glaring positives and negatives...and I don't know enough about cats in general. I guess I'm so used to having dogs (and have never had a cat) that letting an animal roam seems really odd to me. I would assume it's an easier decision if you live away from busy roads, as there's probably less chance of a cat being run over. I don't know what I'd do if I had a cat. I've seen people in America walking their cats on a harness and lead, but surely this brings up problems too...what if they see a dog, and the dog goes crazy and the cat freaks out? Are harnesses okay for cats or can they injure them, like rabbits? I had a friend who had, I think, five house cats by the end. None of them liked each other, so they all had to be separated into different rooms of the house at all times. This meant some of them had no human interaction, and there were no cat toys. They pee'd and pooped everywhere (stress?) and it was really unpleasant. The humans also couldn't leave windows open and had to be careful opening doors because the cats would bolt. Keeping cats indoors can cause them psychological problems, especially if they don't have any stimulation. I can understand keeping pedigrees in as people will try to steal them, but they should have lots of entertainment. I have heard of people walking cats on harness and lead (my friend did when we were little). It's not easy, but it's better than nothing! The road problem is something that can't be ignored now though - cars are always in such a rush and see cats as expendable. Thanks for answering Kate, I've always wondered...we watched an American cat behaviourist TV show, and he was pretty good. I didn't agree with some things he did, but all in all he was a good advocate for cats and mostly used PR methods. Some of the families with indoor cats created some amazing playgrounds for their kitties...a few had shelves that acted as cat climbing frames that went all the way around the living room, at different heights. my best: yesterday we walked all the way to the kennels to check out the field we could rent from them. It is PERFECT!!! Was it Jackson Galaxy - My Cat From Hell? He's good. Americans don't like letting their cats out and he always says their issues are because they are bored. I've seen him get people to walk their cat on a lead, extra litter trays, proper play time. It always makes a difference. I'm surprised more cat behaviourists haven't popped out of the woodwork yet! He is also a big advocate of neuter:return programmes to prevent over-population. The field sounds great! Can't you take dogs in a normal taxi? How far away from home is it? Yes, that was him! A lot of dog behavioural issues can be 'fixed' or improved massively with extra stimulation too, be it play, training or tiring walks. I was talking to someone who had a young Husky and she got nothing other than time in their garden (they didn't even play with her out there!) and they wondered why she was excitable and couldn't settle! First taxi company said they would accept a dog ( ) but that they don't have any larger taxis running today. We'd want a bigger taxi so we could put a blanket on the floor and Kasper wouldn't mess up the seats...plus the bigger ones have more of a barrier between the driver and our dog, so he wouldn't get as nervy. Kasper actually does really well with strangers in cars though. Even after someone we know was an arse and really scared Kasper (Kasp was newly adopted and really excited to see this person, and they very angrily yelled "NO! Stop running about! No! COME HERE!" to him), Kasper was fine with him in the back of a car. Then there was the time when he'd cut an artery and a stranger gave us a lift to the vet, Kasper was fine. No idea why. The field is free today So we're taking Kasper! It's harder to get Zoey there (excitement ) and we want to take them one at a time...I can imagine that Kasper's first time off lead in a year or so he will be very excited, and I don't want him to resource guard anything from Zoey! Phoned up another taxi company and they are fine with dogs too!! I will take lots of photos / videos! So glad the taxi companies are accepting - gold star for them! How was your day at the field? IT WAS AMAZING!! I really want to take Zoey but we've just been so busy We went with our friend to buy his Bearded Dragon the other day (he's wanted one almost as long as I have, so he was thrilled!) because we know where a really good reptile shop is. It was *awesome*! I would love a Beardie, but a 4ft vivarium is biiiiig! Never knew that! Just assumed they'd be much shorter. best: we did it, it finally happened - I CUT (tiny tiny slivers) OFF (one) OF KASPER'S TOENAILS!! Yaaaay! Oh it's okay, we've definitely not been working up to this moment for the last three years, no big deal! Bless him - was he a hero? You DEFINITELY were! Well done, both of you!! I THINK WE'RE GETTING THERE! best: awesome walk with Kasper and Rey today, with Kasper on longline and Raiden off lead with a line trailing behind him. So wonderful - just wish there was a third person who could take photos for us! best: ZOEY GOT TO GO OFF LEAD! It was so wonderful...she had a lovely time, she really really enjoyed herself and she was fantastic! All me and Lyle could say for about an hour afterwards was "didn't she do really well?!" and "that was my favourite walk ever!" Nala (my fave rehome cat that looked like my Foggy) has finally gone to a new home, but it happened last Sunday so I didn't get chance to say goodbye. Never mind, the home is most important. Nigella, Mizzy and Ivy, all long-stayers, were all gone too, and Jerry another hard to home cat, went today to lovely new owners. Good news all round! It must be a mixture of happy/sad when an old friend moves on - but you're right, they're going to a happy home! So pleased we finally got to meet dogs out on walks, we've been trying so hard for the past week and have failed to see a single one. And he did so well! And just as exciting, we need to get a new cage for the gerbies...they recently discovered the height of the Mamble, so are climbing to the top and I'm worried about them falling and breaking a leg. We could pad out the fall with hammocks but they're gerbils, so they would get chewed within minutes! So I'm getting a large Barney cage for the gerbils (same size as Mamble but 20cm lower) and Lyle has said we can turn the spare Mamble into an aviary-type-thing for finches! Definitely adding Society finches, probably a pair. Will also try and add our Society finches into a mixed flight cage too! I love the way these finches look, their beautiful singing (if you get males) and the fact they are so gentle and tend to get along with everyone. 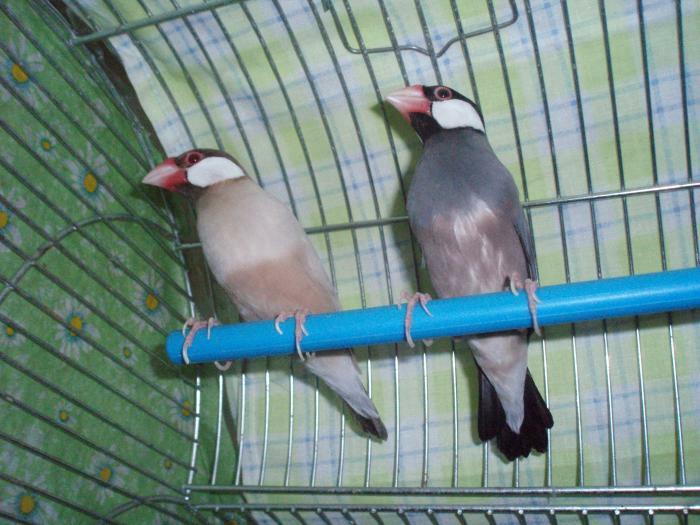 Then we really want a pair of Java Sparrows / Finches. These are really calm and friendly birds (to other birds, not humans...finches aren't good for hand taming), but because they're slightly bigger than other species of finches the smaller varieties can be scared of them. 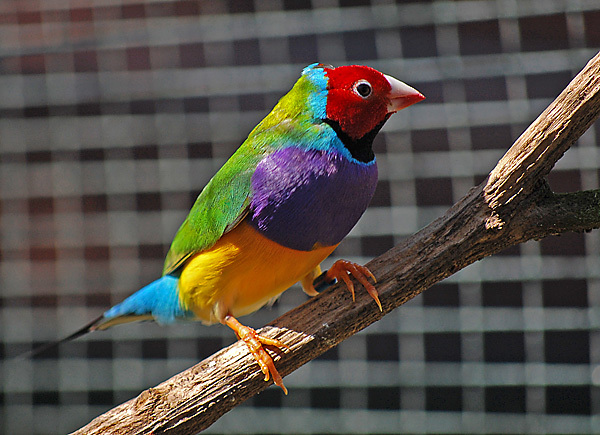 I would love a pair of Gouldian finches...these little dudes just look incredible. They're unbelievably colourful! Unfortunately they aren't as hardy as most other finches, they prefer warmer environments and they're hard to source...would be nice for the colour, but I'm not sure. More research needed. 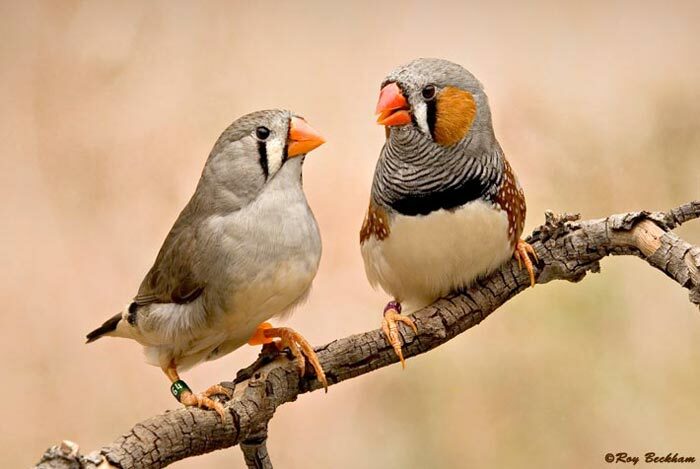 And maybe a pair of Zebra finches...not sure about this breed as they have a middle rating for aggression / pushiness, whereas all the others are deemed passive / sociable. There could be a high chance it would be fine as the Javas are larger (so the Zebras won't boss 'em about) and the Societies tend to be so chilled out, but I need to have a think about it. Java Sparrows are so cool looking...love their big beaks! I was tuning a piano in a house and getting hacked off by this constant beeping. I asked if they could turn their computer off and they said it WAS off. But the beeping was emanating from a cage of finches! See that's why I only want a pair of Zebra finches (well, that and they're pushy), if you have quite a few of them their cute meeping becomes slightly annoying!! I always worry about caged birds - that the cage isn't big enough, they'd rather be flying free ... that sort of thing. But I suppose it's the same with any pet that we have to keep 'enclosed' such as rodents and rabbits etc. Can you let them out to free fly? Then it would be like a hawk I suppose that can be flown but will return and sit happily and safely in the cage until it's next flight (as long as it can stretch it's wings). A very exciting birthday present though! As you said the issue with birds is the same as with any caged pet; they need the biggest habitat you can provide and lots of extra stimulation. Syrian hamsters would naturally forage for miles every night, yet they are caged, often in far too small habitats. Prim has a large cage by hamster standards, yet it's not a a fraction of what he would cover in the wild, and he only gets 45 minutes handling a day. Is he happy? I think so A lot of people seem to think caging birds is cruel whereas with snakes / rodents / fish / even chickens, which are technically birds, it's fine. I think most (small) pets would rather be free roaming, if they could find safety and food as readily as they can in a cage. But I think if you provide the biggest space you can, and fill it with hidey holes, food, treat toys and such, they can live an equally happy life. And in fact in most cases they live longer, are safer and receive better treatment when ill than they would in the wild. The finches are going to stay confined. They're not like Two who was trained to step up and go back to his cage; finches can't be tamed unless you begin when they're extremely young and anything out of the ordinary is very stressful for them. Most places say you shouldn't frequently move where their cage is positioned, as it can make them sick with stress! Wow, I thought it'd be a good thing to move the cage to change their view! I know you will enrich their lives, as you do with all of your pets, and that is what counts. Most people take on something they like the idea of without really investigating the work involved and how to make them happy. I like birds - the bigger the better - but wouldn't know how or where to start! So what birds are you getting? Just zebra finches or a mix? We're definitely going to try get a pair of Java Sparrows, then either Society finches OR Society and Zebra finches. I want Zebra finches, as they are cute, colourful and I love their honks...but need to research their personality more. The hard thing with finches is that there aren't accepted guidelines like there is for other animals...for example hamster cages should be 80cm+ in length, dog crates need to be big enough for the dog to stand, turn, stretch etc...for finches the recommended cage size varies as much as 16 inches length x 12 inches width (height isn't important) to 24 inches x 12 inches.